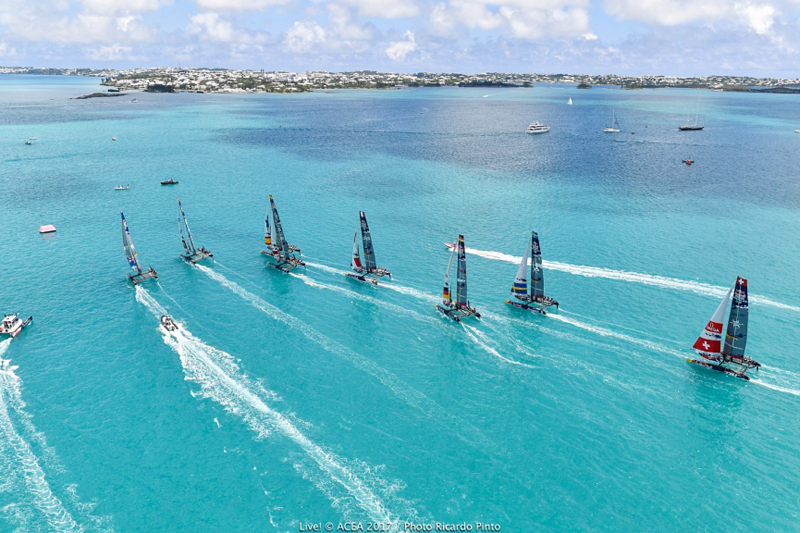 One nation will be crowned champions today [Wednesday] as eight teams prepare to resume competition in the second and final day,of the Red Bull Youth America’s Cup Finals on Bermuda’s Great Sound. Day one of the 2017 Red Bull Youth America’s Cup Finals belonged to Land Rover BAR Academy who seized the early advantage and now sit on top of the leaderboard with 28 points heading into the final day after two second places and a first in the three day-one races. However, with three more races scheduled for today, and a maximum of 30 points still on offer, all of the eight nations remain in contention of being crowned the 2017 Red Bull Youth America’s Cup Finals champions. That includes TeamBDA whose incredible story in the 2017 Red Bull Youth America’s Cup continued in fine style when they sealed a fairytale victory in the first race of the finals against their seven competitors. Having given the packed Grandstand and all the TeamBDA fans in the America’s Cup Village a huge reason to cheer in race one, races two and three proved tougher for the young team, who head into today in sixth place. “It is hard to describe exactly how it felt crossing the finish line in that first race.It was just an incredible feeling which feels you with so much pride, it’s something I’ll never forget,” said TeamBDA skipper Mackenzie Cooper, reflecting on his team’s fairytale moment in front of their home crowd in the first race of day one of the Red Bull Youth America’s Cup Finals. “That first race was those incredible fans and hopefully we give them more to cheer. “We showed in each of the races that we are capable of competing against anyone out there and even when we’re behind we can claw some places back which is encouraging. The size of the safe zone circle around the markers are disproportionate to the size and speed of the boats. The length of start line is also disproportionate the size and speed of the boats. The public needs to know that when two boats enter and while sailing in the zone, redundant rules switch off and new rules switch on. Most if not all racing rules of sailing are designed specifically to avoid collisions. When and where do you think the race actually starts. The length of the race course can directly affect the outcome of the race. The duration of the race can directly affect the outcome of the race. For those who are new to the sport of sailing and to fully comprehend what is taking place, do pay close attention to the comentators.